Thanksgiving is less than a week away, and while old man Winter has been somewhat unforgiving this year thus far, there are still plenty of exciting and fun activities to take part in this weekend, all while staying warm indoors! Below is a list of some of the highlights for each day, to see a more extensive list, make sure to visit our Going Out Guide! Description: For more than 20 years, this alternative rock band from Gainesville, Florida, has inspired audiences with their melodic tunes, harmonies and optimistic lyrics. Doors open at 7:00 p.m. For more information, visit the State Theatre website here. Description: Some 75 breweries bring their winter harvest editions, many from Maryland, Virginia and D.C. One ticket gives you more than two hours of unlimited beer tastings. For more info, visit the DC Craft Beer Festival website here. 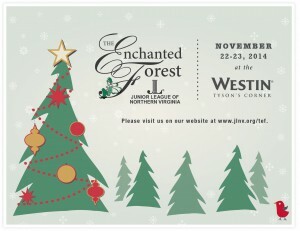 Description: The Junior League of Northern Virginia holds its 14th annual fundraiser, The Enchanted Forest, with 120 theme-decorated holiday trees and events for children like making gingerbread houses and breakfast or brunch with Santa. For more information, visit here.